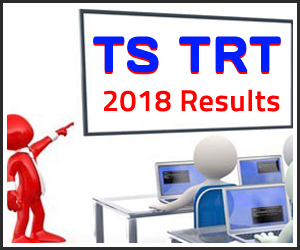 TRT Results of Telangana are likely to be release by TSPSC after successfully conducted written examinations for the School Assistants, Secondary Grade Teachers, Language Pundits, and School Assistant Physical Education & Physical Education Teacher from 24/02/2018 to 04/03/2018. The tentative date Telangana Teacher Eligibility test Results (TS TRT Results 2018) will be in the month of March last week. TS TRT Exam was conducted through a Computer Based Test and OMR. TSPSC TRT SGT, SA, LPs are conducted through OMR as the count of aspirants are more where as TRT SA(PET), Physical Education are conducted through CBT. Manabadi will be providing you the TS TRT Results 2018 Manabadi, TS TRT Score Card 2018, Telangana TRT mark sheets and TS Teacher Recruitment Test results 2018 soon after release by Telangana Government. The TSPSC will announce the announce the cut-Off marks for TS TRT 2018 based on reservation, roster points and other parameters, based on this the candidate will be called for document verification. Marks Memo will be issued on payment of Rs.200/- through Online Payment in favor of the Secretary, T.S. Public Service Commission, Hyderabad. The Marks memo will be available after one month from the date of publication of the results .TS TRT 2018 marks memo will be available only 90 days. Recounting or revaluation will not entertain under any circumstances. The Final Selection of the post will be based on marks secured in the written examination either online or OMR based. Candidates who qualify in TS TRT-2018 in order of merit will be called for verification of Certificates, Community and Category wise for the vacancies available as required. The minimum qualifying marks for Selection are OCs 40%, BCs 35% SCs & STs 30%. The appearance in all the papers at the Written Examination as per rules is compulsory. Absence in any of the paper will automatically render his candidature as disqualified. As candidature for the recruitment is processed through Computer/Electronic devices based on the particulars furnished in the Application Form, the candidate is advised to fill in all the relevant particulars carefully. The preference opted by candidates in respect of posts, District etc., in the application form are only indicative for being considered to the extent possible but not binding or limiting the Commission's powers conferred under Article 315 and 320 of the Constitution of India. Therefore, the Commission has the power to assign a successful candidate to any of the notified posts for which he/she is qualified and eligible, subject to fulfilling the selection criterion. Mere claim of preference for any District for allotment against vacancy does not confer a right to selection for that District in particular or any District in general. TRT PET FINAL RESULT EPPUDU SIR. Social SA final results appudu? When will u release sgt final list? When will we expect trt sa final 1:1 results? I WANT TS TRT HINDI PANDIT P2 RESULT.MY HALL TICKET NO1754203075. Nonlocal Sgt Telugu medium cuttoff marks entha untuntundi? Telugu pandit results 2018Please tell me sir. How to know ts sgt tm results? TRT TS RESULT PLS SIR. When ts Trt sgt results? Trt sgt result inka eppudu istaru sir. sir 53 mrks adilabad bc-a naku job vasthundha? Sir I got only 33 marks in PET EXAM in non local in Urdu medium is there any chance to get job..
sgt telugu 64 tm bc b male medak chances for final ion please? Could the concerned please tell me the exact date of tspsc trt results? sir please tell me how many cutoff marks in sgt urdu medium. Madi nalgonda district yikkada local body catagiry lo 3 post lu unnay .naku trt physics lo 90 tet 98 unnay yemaina hope pettukovachha? Chala web site lo ela na results Petri wait chestinna yevvaru reply evvatledu please reply sir!